Wait, what? A yellow cake that has less calories and fat than the average cake, but which actually tastes as good as, if not better than the real thing? Save me a slice 😉 I present to you: cake made with cream instead of butter! I also received some very supportive comments about my January theme! Anyone here ever heard of aquafaba? It’s the liquid stuff in a can of beans, and apparently you can bake with it. One question though: why is it called ‘aquafaba’? Is it because it’s ‘fabulous water’ or something? (← o haha, just looked it up. It just means ‘bean water’ in Latin ????) I’m definitely going to try to make these delicious looking egg-free macarons with it sometime in the near future (I hope), but for now, let’s talk cake. Cake isn’t healthy. It’s like sugar that way. No getting around it, cake just isn’t healthy. But that doesn’t mean you can’t make it healthier. Which this cake is! It’s a cake made with cream instead of butter, but hey, you already got that from the title of this post. This cake has been on my to-bake list for a long time! Is it three years? Anyway, ever since a Dutch boxed cake mix company launched a new cake mix, made with cream instead of the usually called for butter. 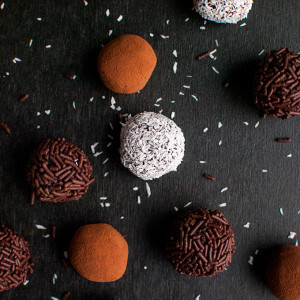 Wait, what are cake mixes like in the rest of the world? Do they call for butter, because Dutch cake mixes usually do. Butter and eggs. But anyway, since cake mixes are usually just a mix of flour, sugar, flavor enhancers and rising agents, I thought about making a similar cake from scratch. Which this is! And guys, it’s DELICIOUS! And yes, a lot healthier, actually. 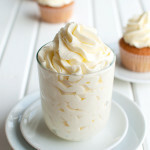 Whipping cream contains about 35% fat, while butter is 83% fat. If you take a look at my go-to yellow cake recipe, which you can find in this post, you can see that, for two cake layers, my regular yellow cake recipe calls for 150g of butter, which means 124g fat. 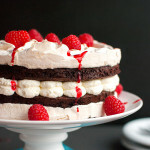 THIS recipe, on the other hand, calls for 230g of whipping cream to make two cake layers, which means 80g of fat. As the other ingredients called for in these recipes don’t contain a lot of fat (buttermilk and flour have negligible amounts of fat) and both recipes use 2 eggs, I think it’s pretty safe to say that yes, this cake contains 36% less fat! Next up, beating the eggs until they kind of look like cake batter all by themselves. Just beat them on high speed, using a mixer fitted with the whisk attachments (I used a handheld mixer) and beat, beat, beat. At first, the eggs will foam a lot, but as you keep beating the larger bubbles will pop and you end up with something that looks like thick, pale yellow cake batter. Mix in the sugar one spoonful at a time, then fold the whipped cream into the beaten egg mixture with a rubber spatula until mostly incorporated, then mix for 5 seconds with the mixer (cause who wants to fold until their arm falls off?). Fold in some dry ingredients like flour, baking powder and salt, mix for another 5 seconds until the batter looks smooth, and done. 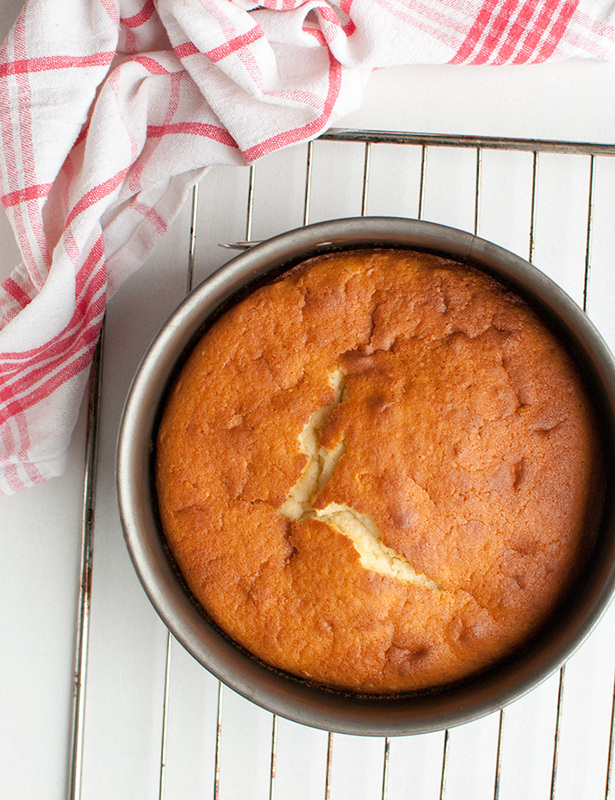 Plop the batter in a cake pan and bake until golden brown and perfect. The Rocking Rebel and I were both blown away by the flavor of this cake! Subtly sweet, with a mellow vanilla flavor and a fresh creamy taste. Great texture, too! A bit dense, but in a good way, and very tender, with a delicate crumb. Yum! I think this cake would go great with fruity frostings like strawberry buttercream or lemon cream cheese frosting. 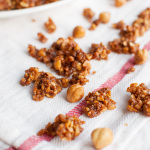 And if you want to pin this recipe, scroll down for a nice pin. 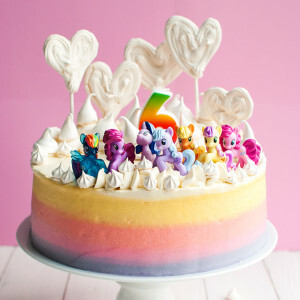 And make this cake. It’s sooo good! 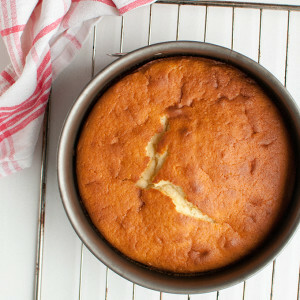 Because this cake is made with cream instead of butter, is has a lot less calories and fat than your average yellow cake. It's still delicious, though! Serves 8-10. Preheat oven to 175°C/350°F (standard oven setting). 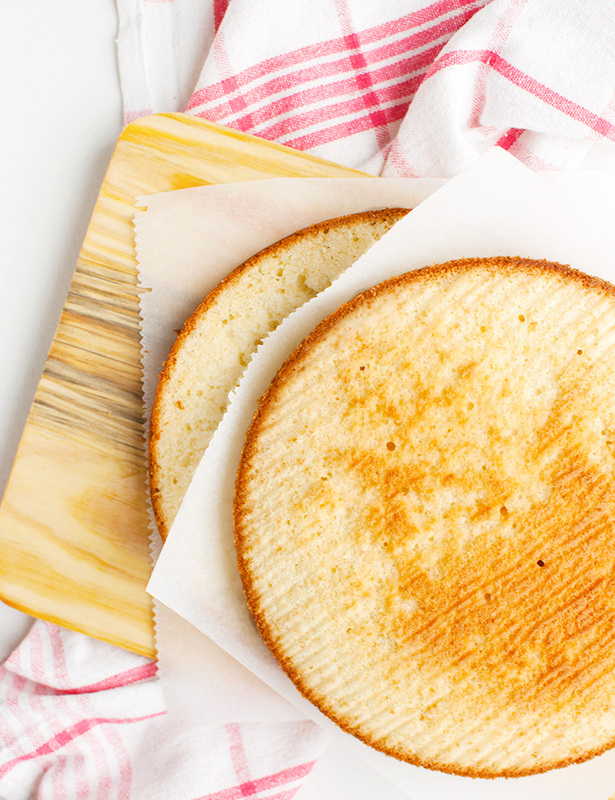 Lightly butter a 18-cm/7-inch round cake pan and line the bottom with baking parchment. Set aside. In a medium-sized bowl and using a mixer fitted with the whisk attachment, beat the cream until it holds stiff peaks. Set aside. In another medium-sized bowl, using a mixer fitted with the whisk attachment, beat the eggs until they have tripled in size and have turned a pale yellow, about 3-4 minutes on high speed. Most of the bubbles should be gone, but the eggs should look somewhat like meringue. Add the sugar one tablespoon at a time, mixing continuously. Once all the sugar has been added, add the vanilla and mix to combine. 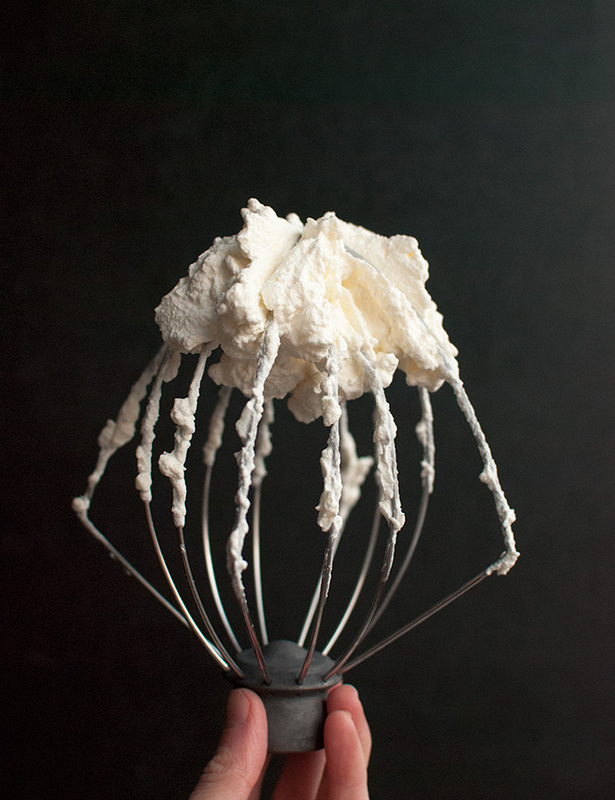 Using a rubber spatula, fold the whipped cream into the egg mixture. Once mostly incorporated, mix for 5-10 seconds until smooth. In a small bowl, stir together flour, salt and baking powder. Add the dry ingredients to the cream and egg mixture and fold with a rubber spatula until mostly incorporated. Again, mix for 5-10 seconds to make the batter smooth. Transfer the batter to the prepared cake pan and bake on a rack in the middle of the oven for 35 minutes, or until a tooth pick inserted into the center of the cake comes out clean. Remove fro the oven and allow to cool in the pan on a wire rack. 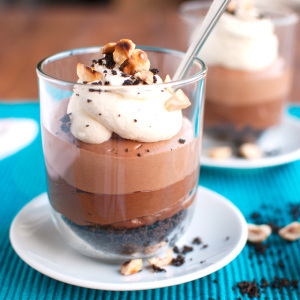 Serve warm or allow to cool to room temperature. Cake keeps, stored in an airtight container, for about 3 days. Hi Pete, I actually don’t think fat is necessarily unhealthy. I know the human body needs fat in order to function properly. I also believe that butter is not necessarily unhealthy. Organic butter made from the milk of healthy cows who have been able to feed on grass actually contains a lot of essential fatty acids in all the right ratios, including conjugated linoleic acid, and important vitamins such as A, D, and K.
But. As you may know, butter is also very high in calories. Again, your body needs calories to function properly. But if you consume more calories than your body needs, the excess calories are stored in the form of fat, which can lead to obesity and all the health risks that go with it. So there. Reducing the amount of fat in this cake by using cream instead of butter, reduces the amount of calories in each slice. Which means that, if it were between a slice of this cake and a slice of your average yellow cake, the possibility of excess caloric intake decreases if you eat this one. It looks delicious! Except less fat, it is also fun to try to replace the butter for cream. How nice that you’ve moved the recipe to the other side of the ocean. So glad you decided to continue, I love your mildly hyperactive jolly style. for the same benefit/disbenefit of fat intake. egg replacement) I wasn’t impressed. I await the result of your experiment. Haha, I love the way you describe my writing style, David! Made my day ???? I’m also really glad you like my blog. And yeah, you’re sooo right. Blogging and baking should be fun, and experimenting with different, maybe healthier ingredients is definitely a big part of that. Though I think I’ll skip the baked bean juice 😉 Have you tried making the aquafaba yourself? I have my doubts about using the canned stuff because of BPA. I love that the source of inspiration for this post was a boxed cake mix. (Yes, we have them here in Canada too!!) What a smart idea to use cream instead of butter as the fat. If it tastes just as good , or even better than the higher calorie cake made with butter, that’s just a bonus. I love dense cakes so this is perfect. I have also been reading about aquafava. I find it fascinating. I have not yet tried it. Trying it out for the first time with macarons is a braves move!! Regular macarons are challenging enough. I was thinking of trying it in matzoh balls for my vegan niece. I love dense cakes too! 😀 I was soo impressed with the flavor of this cake, though. Bot so overly buttery. Very creamy. I’ve never tried matzoh balls, but they sounds like a great first recipe to try with aquafaba instead of eggs! I didn’t even think about how tricky macarons can be even with egg whites. Maybe my aquafaba-macaron plan isn’t such a good idea ???? oil often water or milk. Yes, it DOES sound like a fancy cake, doesn’t it? And because the flavor is delicious and delicate, it feels like a fancy cake, too 😉 But with less calories!